Germania suffers under the yoke of the Roman Empire; a heartless empire, always on the lookout for new conquests. Its legions pillage and sack the land and cause great Teutonic hatred. 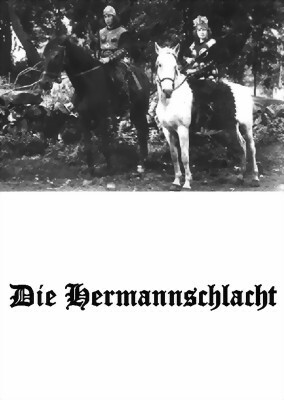 Hermann, the son of the Cherusci prince Segimer, is being held hostage by the Romans as a guarantor of the Germanic people's good behaviour and has been given the name "Armin" by the conquerors. Ultimately, he will lead the army, which will drive out the Roman tyrants. This 1924 film contains exaggerated Teutonic myths; and the nationalism, which led to the consolidation of the German states under Prussia and eventually to the First World War, is very evident throughout the film. In the postwar atmosphere of a defeated Germany, with rampant inflation and a French/Belgian occupation of the Ruhr, the real message of this film is clear ... and it's a message, which would be welcomed by many people, which would lead to the next world war. The original print was seized by Bolshevik conquerors in 1945 and sat gathering dust on the shelves of the Central Film Archives of the USSR until that empire, like the Roman one portrayed in the film, ended up a footnote of history. The print was once more brought to light in 1990. DVD-R has German interttitles and switchable English subtitles. LENGTH OF FEATURE FILM: 54 mins.